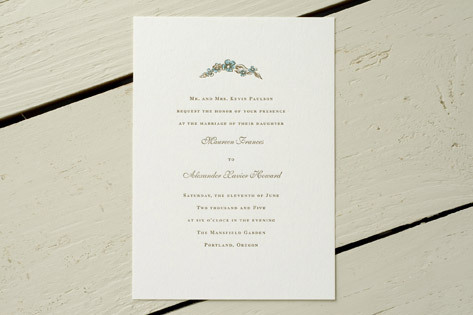 An elegant floral bouquet sets the stage in this refined letterpress wedding invitation, which takes its inspiration from the grand Southern event for which it's named. Classic sans-serif type blends with romantic script for a truly upscale look. Available in cerulean/brown (shown), navy, black, grey, brick/brown, and pumpkin/grey-green. Fonts shown are Caslon Small Caps and Shelley Volante Script.